1. You need a decent microphone (even a Rock Band mic is fine by me) with little to no background noise. 2. I would like the auditions to imitate the respective actors, i.e. Connor Bringas, Jennifer Doullard, Deem Bristow, and Lani Manella. 3. More than one take when recording. 4. A Discord would be nice, but you don't need one. Sonic is a fun-loving, hyperactive hedgehog with incredible speed. However, he's frantically searching for the truth behind his framing and his mysterious impostor. And now that Eggman has a new sinister plot that involves this impostor, Sonic has his work cut out for him this time. 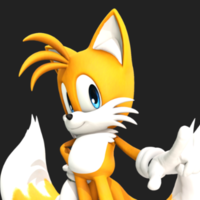 Tails is a young fox boy who is not really a sidekick to Sonic, but more of his best friend and personal mechanic. He's very smart for his age, but he doesn't constantly spout tech mumbo jumbo. He's very determined and tries to become more independent of Sonic. Amy is a cheerful girl who only loves two things in life: Soft Serve Ice Cream, and Sonic. She has definitely come into her own over the years, and just like Tails, realized she can become more independent from Sonic. Her love for him is still blatantly obvious, although she has toned it down a little. Dr. Robotnik is an evil genius who wants to take the world hostage with the Eclipse Cannon. However, this Shadow character is somewhat unknown to him, and he doesn't even know if he can trust him. Rouge cares about one thing only: Gems. She'll do literally anything to get one, no matter how extreme the task. She also works for the government, presumably because they're paying her in jewels. Shadow the Hedgehog is a mysterious soul. No one knows why he was created, or why he's still alive, but one thing's for sure; he's getting the chaos emeralds. My name is Shadow. In appreciation for awakening me, I shall grant you your wish. I'm the impostor? Ha, aren't you the fake one here? I see, but I can no longer allow you to exist. Your so-called adventures... I'll put an end to them here! !